If three years ago someone told me that I’d be able to watch live events on my phone, I’d just tell that individual to go and sit down somewhere jare. When it comes to streaming events, this was made available by YouTube but where events, programmes, shows that have already taken place. Now technology has gone so far to the extents that every android smartphone user can now enjoy an online live streaming anywhere and anytime without costing you so much. This has been made possible with an android app which is called Mobdro App. I have been using it for a while noe and it has never failed me. Just yesterday while preparing to watch the World Cup qualifying match between Argentina vs Ecuador live on TV, NEPA failed once again and I was thinking of the next available option. The next thing that came to my mind was to make use of my Mobdro app to stream the match live directly from my phone. I had my 9mobile cliq4Dnite available and I watched the match live for the whole 90minutes without any glitch. The Mobdro app is an android app that provides it users with constantly free video streams available on the web and makes them accessible for you to watch on your mobile device. No matter the kind of shows and events you love, Mobdro will always make available something for you to watch. Mobdro has over 2,000 available channels for every show be it sports, movies, documentary and lots more. 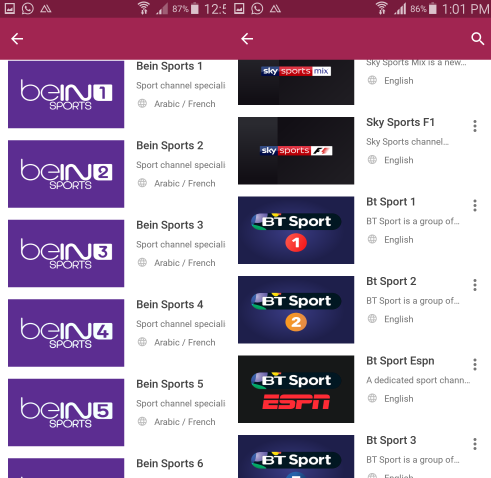 It contains some popular channels Sky Sport 1-5, Bein Sports, Euro Sports, BT Sports, ESPN, NatGeo Wild, Animal Planet, Discovery Channel, MTV Base, Vevo Hits, Hip Hop TV, Sony Max, Wrestling, Sky News, ALJEEZERA, BBC, ABC, CNN, Action Movies and many more. Cool isn’t it??? Mobdro android app has two versions: Freemium and Premium. Freemium is completely free, while the Premium version has some extra features, like capturing streams and ChromeCast support, and is free of ads. As at the time of writing this post, I’m glad to let you know that there is one Mobdro Freemium Official version which has features of the premium version. It is known as Mobdro Version 2.0.48. This version will save you from free advertisements on live streaming apps. It can set you to watch free movies and TV shows without paying anything at all. I have use the former version of it b4.i must confess that the apk is nice. The only disadavantage of the apk is that it only have alot varieties of dstv channel.